WASHINGTON — Alaska Sen. Lisa Murkowski isn't happy with the behind-the-scenes track that Republican leadership is using to move a health care bill through the Senate. She's not writing off voting for legislation to repeal and replace the Affordable Care Act, but for now, Murkowski has no idea where the bill is headed, she said in an interview Tuesday. Murkowski is one of several moderate Republican lawmakers expected to make or break a health care bill, given the slim balance held by the majority party. Republicans hold 52 seats in the Senate, and will need 50 votes for passage of the bill using a process under budget reconciliation. Vice President Mike Pence can provide a tie-breaking vote if needed. Over the last week, Sen. Majority Leader Mitch McConnell, R-Ky., said that leadership is close to completing a proposal, which he hopes to bring a bill up for a vote before Congress breaks for a recess around the Fourth of July. Recent reports indicate that a bill could be sent to the nonpartisan Congressional Budget Office for review any day now. The process for this bill — written by leadership staff behind closed doors — isn't the usual route for legislation. A draft may not be circulated before the final version is released. There are no plans for committee hearings to vet the language, take expert testimony or vote on a first round of amendments. Murkowski, who sits on the Senate Committee on Health, Education, Labor and Pensions, isn't happy about that. She was not initially invited to join a group of 13 Republican senators who are leading the crafting of the legislation, though those meetings are open within the party now. "I think that we do better as a body when we respect the process. And the process allows for committee involvement, debate and discussion," Murkowski said. The senator said Tuesday that as far as she knew, no bill had been sent to CBO for review yet. But she also didn't know what is being included in the nearly finished legislation. At a Republican lunch meeting Tuesday, Murkowski said she "did bring up that I felt it was important to make sure that we got something right for the country, not compressed into a deadline. In other words — don't move so fast that we don't get it right." She said she would have a problem with a bill that came up for a vote without a chance for review beforehand. "If I'm not going to see a bill before we have a vote on it, that's just not a good way to handle something that is as significant and important as health care." McConnell is instead pushing forward with using a Senate rule that allows him to send a bill directly to the floor without going through committee. "Do I think that's the best route to go? No. I'm a process person," Murkowski said. "It is certainly my hope that when the time comes to have a measure on the floor, the is ample opportunity for debate and consideration and amendment." For now, Murkowski said she isn't ready to speculate on whether she'll vote for a bill she hasn't seen, though she has publicly registered deep concerns with the route taken by the House of Representatives. While Murkowski is unsure whether her message is landing with leadership in the Senate, she has made some headway at the White House, she said Tuesday. 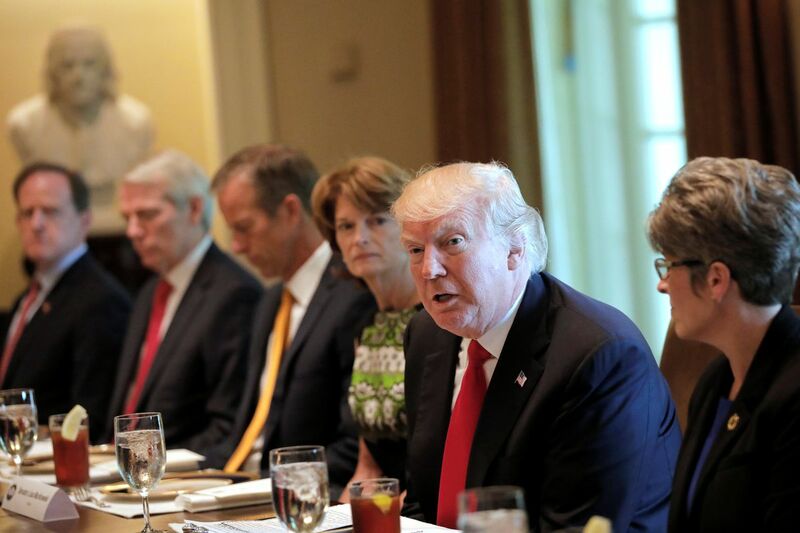 Murkowski was one of 15 Republican senators who had lunch with President Donald Trump and Pence at the White House on Tuesday. The Alaska lawmaker was seated next to the president. "I told him that in Alaska we've just got a different set of facts, a different dynamic, which he recognized when he started the conversation," Murkowski said. "He was talking about how various states had been impacted by increases in premiums and noted the fact that Alaska knocked it out of the park at over 200 percent increase. So I was able to speak a little bit to the Alaska specifics and why flexibility is needed in a place like Alaska where we're such an outlier." Trump began the meeting with compliments for Republicans in the room who are "working very, very hard" on "a bill that's going to be a phenomenal bill to the people of our country: generous, kind, with heart," according to a press pool report. But Murkowski said that Trump didn't lobby for her vote during the lunch meeting. 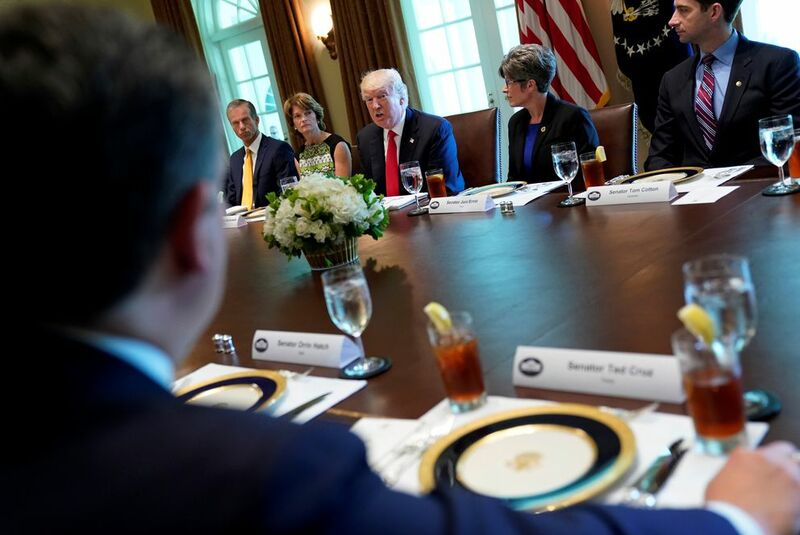 Trump "was very clear that he would like to find a path forward for health care reform," she said, but the discussion was broad-ranging in topic.